Are you thinking about switching to a mobile-friendly corporate eLearning program? Do your stakeholders and managers still need to be convinced? In this article, I'll share 7 surprising mobile learning statistics eLearning professionals should know, as well as 3 tips to create mobile-friendly content for your on-the-go employees. Developing mobile online training courses takes time and resources. However, mobile learning offers a variety of advantage to organizations big and small. From improved knowledge retention to increased employee engagement. As a matter of fact, there are countless research reports and studies to back up that claim. 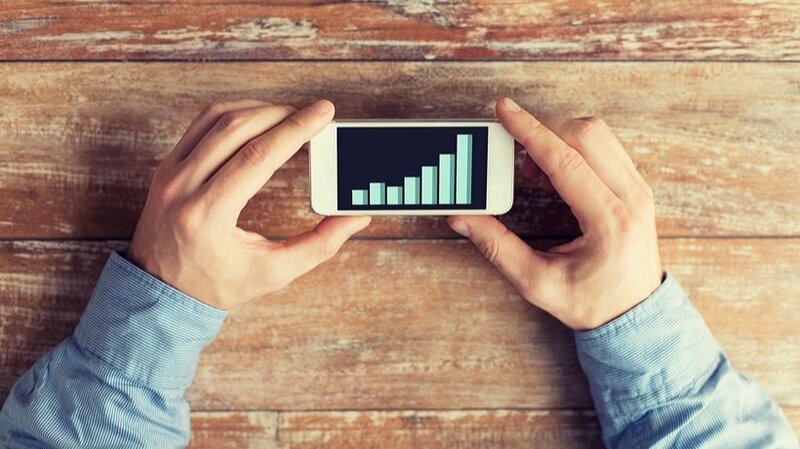 Here are 7 mobile learning statistics that may surprise eLearning professionals. 47% of organizations currently use mobile devices in their training programs . Roughly half of all businesses understand the importance of providing mobile-friendly content to their employees. They know that it boosts engagement and knowledge retention. As such, their staff gets more from the mobile learning experience, and organizations get more from their corporate eLearning budgets. It's a win-win situation! The mobile learning industry is worth more than $5.3 billion. That number is expected to skyrocket to $12.2 billion in 2017 . Mobile learning is here to stay. In fact, it's growing by leaps and bounds on an annual basis. This is primarily due to the fact that it offers employees constant access to information. They're able to build skills and expand their knowledge from anywhere in the world. Online training experiences are no longer tied to one location. Nor do they adhere to a strict schedule. People have the opportunity to bridge the gaps whenever it's most convenient for them. 3. The Mobile Workforce Is Going To Double Or Triple In Size By The Year 2018. According to Gartner , the mobile workforce is going to double or triple in size by the year 2018, as more and more remote workers now rely on their mobile devices. They use them to communicate with friends, conduct business, and expand their professional knowledge base. Their smartphones and tablets help them increase productivity and get the information they need, even if they never step foot inside the office. Based on a Google report, more and more people use only their mobile devices compared to those who use only their desktop PCs. Furthermore, 40% of people rely mainly on their smartphones . We live in tech-centric times. Thanks to modern advancements, we now have the power to learn whenever the need arises. Our mobile devices are more convenient and portable than desktop PCs. As such, they can travel with us and keep up with our busy lifestyles. We are gradually making the shift to more intuitive and integrated technology. 70% of on-the-go professionals will take care of business on their personal mobile devices by the year 2018 . Employees aren't waiting around until their companies switch to a BYOD strategy. They are using their own mobile devices to focus on their professional development. These employees know that mobile learning will offer them the resources they require anytime, anywhere, whether they are meeting with a client or troubleshooting a software issue. According to Gartner, mobile device users will own three to four personal devices, on average, by the year 2018 . You can never be too careful. Especially when it comes to mobile accessibility. Busy employees need immediate access to online training materials. If one device fails or isn't right for the task, they always have another on-hand. For example, certain online training content, such as serious games and simulations, may be easier to view on tablets. The average person looks at their smartphones roughly 221 times each day . That may seem like a lot. But just think of how many times you check your email, read social media posts, and watch videos. All of these activities add up over time. In fact, we spend a good percentage of our day "plugged in", and informal learning occupies some of that time. Responsive design authoring tools are sweeping the corporate eLearning world by storm. They allow you to create master layouts based on breakpoints. As such, employees are able to access the materials on a broad range of devices. Best of all, they receive the same experience, regardless of whether they use a smartphone, tablet, or PC. Most tools even allow you to preview each layout and make necessary changes before you launch. Do some research and test out different Learning Management Systems to find the best tool for your team and your corporate eLearning budget. Mobile learning should be easily accessible and even easier to digest. That's one of the benefits. As such, you must keep your online training content bite-sized so that employees are able to get the information they need. For example, a 3-minute video demo is preferable to a 30-minute course. Corporate learners are usually looking for specifics that help them complete a task or solve a problem. They can always participate in more comprehensive corporate eLearning experiences when they have room in their schedules. In most cases, you can't simply upload your current online training course and say that it's mobile-friendly. You have to do minor modifications, such as shifting the images or resizing the text. However, you are able to repurpose your existing online training content to save time and money. Evaluate all of your assets, meet with your eLearning team, and choose the best material. Then make it mobile-friendly. Add larger buttons, make hyperlinks more visible, and opt for legible fonts. You can also turn text blocks into bullet lists and engaging infographics. Mobile learning is no passing fad. In fact, more and more organizations are now using responsive design tools to provide mobile-friendly online training content, which makes perfect sense, given that it helps improve ROI and workplace efficiency. Do you have any surprising mobile online training stats you'd like to share? Now that you know the benefits mobile learning, do you want to create truly memorable and engaging mobile learning experiences? Read the article 8 Tips For Developing Mobile-Friendly eLearning Courses and offer mobile learning courses that are suitable for smartphones, tablets, and other mobile devices.